Last Sunday's edition of the Toronto Star featured a story on two well-recognized Canadian charities admitting to using a discredited fundraising technique which involved more than just a "flat fee" being paid to fundraisers who knocked on doors, called on the telephone, etc. Please see the link to article for additional information. Canadians that generously donate their money to help charities shouldn't have to second guess where their money is going, but rather they should feel confident that 100 per cent of their contribution is going to the cause at hand. With that said, Sleeping Children Around the World (SCAW), a not-for-profit organization based in Toronto, is dedicated towards providing bedkits to children living in underdeveloped countries, and was recommended in an article in the Toronto Star as one of the best charities to donate to. Since the organization's inception 37 years ago by Murray and Margaret Dryden, parents of hockey legends Dave and Ken Dryden, more than 880,000 bedkits have been donated to children to help save lives. Furthermore, SCAW prides itself on ensuring that 100 per cent of every bedkit donation reaches a child in need by sending volunteers to each of the different countries to hand-deliver each bedkit to the appropriate child. The child is photographed with the bedkit and this photo is sent to the donor. Australian Les Wearne and the Scarborough Beach Polar Bears collect and recycle cans and send the funds raised to Sleeping Children Around the World. They've been doing this since 2004. 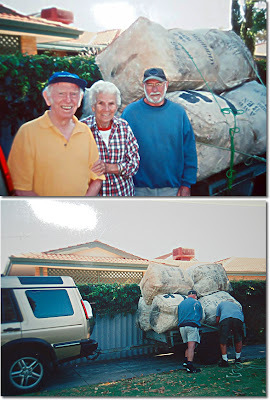 The top photo shows from left to right: Les Wearne, his Canadian wife Elspeth, and Alan Rimmer. They are about to deliver this year's load shown in the background to the scrap metal yard. The second photo shows Alan Rimmer and John McDonald, owner of the trailer and four-wheel-drive car, making the load secure. Sarah Axelson recently travelled to Nairobi, Kenya with the group Sleeping Children Around the World, to distribute bedkits to children in need. After completing her education, Sarah Axelson wanted to do a little travelling. Unlike many in her situation who wind up touring Europe or taking long road trips, she also wanted to make a sizeable difference in the lives of others. Axelson joined Sleeping Children Around the World (SCAW), a not-for-profit organization that delivers bedding, clothing and other much-needed supplies to children in developing nations. She said she was drawn to the organization not only because of the work it does, but also because SCAW promises that every cent invested in the charity reaches those who the charity helps. "The volunteers pay their own way to get over there and every piece of every donation winds up over there," she said. "It was really important to me that 100 per cent of donations went toward children and not toward administrative costs." 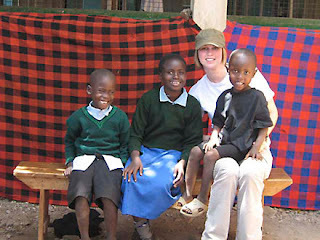 She and a team of fellow volunteers went to Kenya in the spring, where they handed out 4,000 bedkits in Nairobi, Kenya. The Mount Pleasant Road and Davisville Avenue area resident said her arrival in the poverty-stricken country came as a huge shock. "I was really not prepared to see that kind of abject poverty," she said. "In the slum areas, there's no infrastructure at all - no running water, no electricity, none of the things we take for granted." The volunteers spent their time not only dispensing bedkits but also interacting with the Nairobian children, an experience that made the trip as inspiring as it was rewarding. "The best part of the whole trip was that when you got there, you remembered that wherever you are around the world, kids are kids," Axelson said. "They were dancing, singing, playing, and it was a lot of fun playing games and singing with them." She added that the volunteers and children enjoyed their time together so much that the children were actually shocked when they were handed their bedkits, each of which contained a mattress, blanket, sheet, pillow and pillowcase, towel, clothing and mosquito netting. "They were so happy just to have people to play with, they really didn't expect anything more out of it," she said. An added benefit to the SCAW's work is that everything in the bedkits is purchased in the country where the volunteers are handing out the packages. That way, not only are local children getting invaluable supplies, but businesses get a boost as well. Of all the items in the SCAW bedkits, the insecticide-treated mosquito netting is the most expensive, but by far the most needed. Every 30 seconds, an African child under the age of five dies of malaria. Axelson was so moved by her experience with SCAW that she has already signed up with the organization again. She is currently on a waiting list for a trip in 2009. For more information on Sleeping Children Around the World, visit www.scaw.org. Donors to Sleeping Children Around the World have the satisfaction of knowing 100 per cent of their donation makes its way to children, as well as seeing the specific children their money has helped. Here Marne Huys poses with two of the children to whom she delivered bedkits. When Marne Huys visited Kolkata, India, in January she knew she would never forget the faces of its children. Huys, who lives in Brampton with her husband, and a team of five volunteers from across Ontario travelled at their own expense with the charity Sleeping Children Around the World (SCAW), to distribute bed kits to children who did not have the necessities required for a good night's rest. Her time in Kolkata (formerly Calcutta) was filled with exciting days of distribution under an intense sun and, according to Huys, it was worth every minute. "Every time you meet another child, you know if you didn't have a shower when you left in the morning, the first child you saw that was the end of that. You didn't think about your shower," she says. SCAW seeks to help make the lives of disadvantaged children in developing nations a little more comfortable by providing them with a variety of necessities needed for sleep and everyday life. Some of the contents of the bed kits differ from region to region, but those donated in Kolkata included a mattress, pillow, clothing, soap, a towel, water bottle, lunch box, school bag and toothbrush-- among many other necessities. Bed kits are purchased for $30 and, after they are delivered, donors receive a photograph of their bed kit and the child who received it. The lack of essential belongings, such as a bed to sleep in, speaks to the issue of child poverty. According to Free The Children, more than 650 million kids live in extreme poverty in many nations throughout the world, including developed countries. However, the founders of SCAW believed poverty in poorer nations was increasingly difficult compared to poverty in developed countries due to an absence of efficient welfare or medical systems and charitable organizations. After witnessing the effects of poverty in a developing country first-hand, Huys agrees it cannot be compared to developed nations. "There are just too many people and they don't have the social system that we have." Huys decided to get involved with SCAW about 30 years ago while working with the Girl Guides of Canada, after she realized it would be a great way for the Brownies to earn their public service points. The 65-year-old continued her work with the organization as superintendent of her church where the congregation donated bed kits for charitable events. Following those experiences, she realized that it was not only a great and unique way to give but also a successful way to teach children about giving to others. "Kids don't always understand giving to cancer or giving to heart but they always understand giving to a poor child. You give them the bed kit, they try on the outfits, and they sleep on the floor and find out what it's like. It is much better on the mattress," said Huys. After helping the organization from afar for a few years, Huys decided to make a trip to donate bed kits in the flesh and, in 1997, she visited the Philippines with SCAW. That experience, coupled with the mother and grandmother's love for children, sparked a series of future trips. Huy's visit to Kolkata in January was her third with the organization. She also visited Mumbai in 1999. She says one of the things that attracted her to the organization was the transparency of their work. "I think that the most important thing is that the whole $30 that is collected goes to the child." Huys also loves that the organization is uniquely Canadian. It was founded by Murray and Margaret Dryden, parents of legendary hockey players Dave and Ken Dryden. On a trip to India in 1970, Dryden accidentally tripped over a child who had been sleeping in the street. Since he could not alleviate world hunger alone, Dryden figured he could at least help make children happy and healthy by ensuring they had a decent bed to sleep in. That very year, the Drydens created SCAW and distributed 50 bed kits in Pune, India. Margaret passed away in 1985 and Murray in 2004 but little has changed. Working out of the former Dryden family home, SCAW continues to fulfill Dryden's dream of putting kids to bed all over the world. To date, SCAW has delivered 883,850 kits worldwide. It was Dryden's wish have a million kits donated by 2010 and, considering the current numbers, it's likely that goal will be met. Huys believes the vision and action of SCAW's operators and volunteers represents goodness in the human race, "I think it shows us we have very caring and giving people and that they do care for their fellow men regardless of where it is." Huys choice to go back to India this year has left her with many memories, a longing to continue to reach out and help disadvantaged kids and a few realizations about the lives that some children lead. "You think isn't it a wonderful life that they're living and they don't realize that they don't have a bed to sleep on?" she says, "And then you come back here and you see a child, my own grandchildren, with all these toys and you think, 'there's something wrong with this world.'" For many of the children, the day they receive their bed kits is the best day of their lives because most of them have never been given anything. "When you hand the bed kit to them and say 'This is for you' you can just see it's total shock but it's getting to be all smiles," says Huys. Children from the poorest families are chosen by their teachers and are given ID cards they must keep until the day of distribution arrives. It was Dryden's belief that helping school children sleep well would ensure academic and life-long success. Amidst all of their appreciation, the kids are also amazed at the idea of donating. "They're just wondering how the money can be collected over here and how it gets all the way across the ocean and buys them that bed kit and gives it to them because they just can't understand that somebody over here cares about them." The thought, Huys said, gives her goose bumps. Since 1970, SCAW has helped hundreds of thousands of children, still just a fraction of those in need, however. Following the example of one Canadian couple, people like Huys are helping tuck children across the globe into a clean and comfortable bed at night, one that they hope will foster sweet dreams and success. For more information about SCAW go online to www.scaw.org.